In Taiwan, Immigration is quick and easy, and after that headed to the tourist office at the airport. to get bus info to my hotel and get a map of the mass rapid transit (MRT), there is also an ATM next to the Tourist office. Hotel: Stayed a mile from Taipei 101, close to lot of tourist attractions, MRT train station and Night Markets. There is also an Airport Shuttle that has a stop nearby. Tip: Public transportation is very good in Taipei, I bought a 24 hour MRT pass, good on all subway trains. Weather: November is hot and you'll need an AC at night, clear days and no rain. If you staying downtown or visiting, you cannot miss Taipei 101, there is also a subway stop for Taipei 101. The entrance to the the tower is through the mall. Go there early to avoid long lines, the cost is about 15 US$ for the observation deck, has great views of Taipei. There is a large indoor and a small outdoor observation. The ticket to the 101 is only good for 1 visit, wanted to go to the Observatory at night for some photography, was told a new ticket would be needed. Take the Metro from Taipei 101 to Chiang Kai-shek Memorial Hall Station, once outside the station you'll see the Memorial Hall, wear some good walking shoes and give yourself a good hour to see the whole place. Night Markets are basically Street Markets with mostly food vendors, there also other vendors selling clothes, books, toys ect. There are several Night Markets through out Taipei, they can be busy and its an experience in itself, while in Taipei its a must see, and try the foods. While in Taipei, one can get by with English, at the night market I bought fruit from a vendor who didn't speak any English, still managed to buy some delicious Fruits. 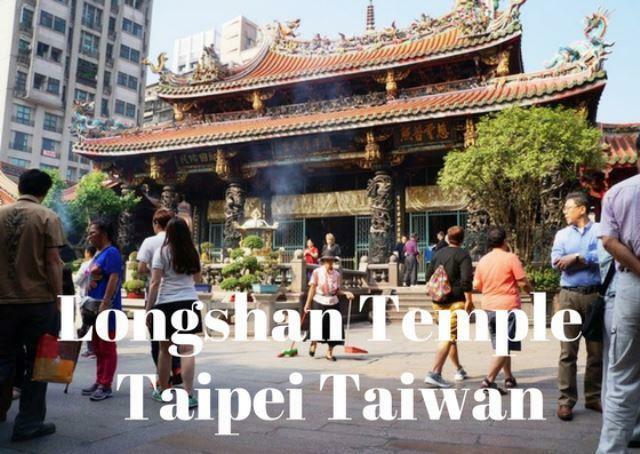 Another must see sight in Taipei, take the MRT to Longshan Temple station. The temple itself is not very big, the architecture is very impressive. Lots of locals come there to pray. There is also a night market nearby. I visited Burj khalifa a year or so before Taipei 101, there was no signs at Burj about Guinness World Record breaking high speed elevator. Those markets look amazing! I've never been to a night market (there aren't such things in Europe). What was your favorite food in Taipei? Taiwan looks like it is full of history and culture. Great post. I really enjoyed Taipei, such a great city! Taipei is a great city. My next door neighbor is from Taiwan. Such nice people, in my opinion. I have had the pleasure of enjoying authentic food from Taipei courtesy of our neighbor. Hopefully 1 day I will visit Taipei. Until then I will enjoy reading this post. It is my home country! Did you enjoy it? What food did you try at the night market?